A traditional and distinctive Turkish designed and built motor sailing yacht. MEZCAL was built by one of her current owners in Turkey. She arrived here in early 2013, making her the only gulet available in the western hemisphere! She is fiberglass over custom mahogany and sapele wood. Built to encourage life on her spacious decks – from her large bowsprit and dolphin striker, to her luxurious and spacious main and side deck areas, and fully-functional sails to supplement her twin engines. She has a large covered area aft for lounging and eating, behind the protected pilothouse and control station. Inside, she features more gorgeous woodwork flooring and finishing, within a large main salon plus 6 double cabins, all with en-suite heads. She is maintained by a full-time crew of 5. BE THE MOST DISTINGUISHED BOAT AT ANCHOR OR IN THE MARINA! Ask about the possibility of a fractional ownership too. West Florida Yachts would love to guide you through a personal showing of this 92' Custom Turkish Gulet Motor Sailing Yacht 2008. 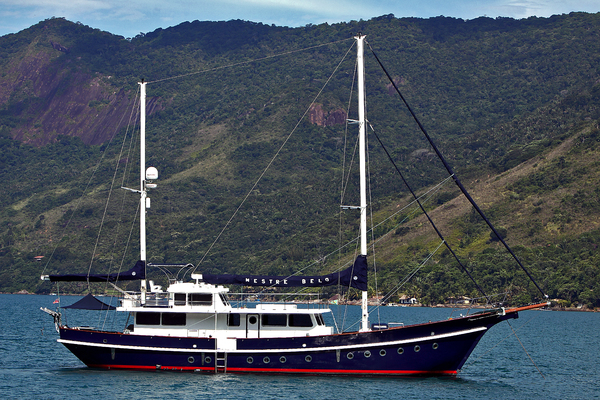 This yacht for sale is located in La Paz, BCS Mexico and priced at $1,300,000. For a showing please contact us by filling out the form on this page and we will get back to you shortly! Full forward is a large bowsprit with dolphin striker and “sailor catcher” netting. Two white masts, varnished 2-level cabin side. Large chrome-trimmed windows, varnished raised pilothouse aft. Steering station is portside of the pilothouse, equipped with full electronics and engine controls. Boarding ladder on starboard side, 20’ passerelle stored at the aft rail. Large covered area aft. Dining area, lounge area at stern with cushions. Areas below are accessed through the main salon which has a bar to starboard. To port is a long settee and two dining tables. Three cabins forward, all with en-suite heads. Large main salon amidships. Three additional cabins including master cabin aft. Below decks and full forward is a crew cabin accessed from the foredeck. Galley and machinery space are below the salon and accessed from a stairway forward and starboard through the bar. Main Salon has 4 windows forward, two of which open outward. Enter the main salon from the pilothouse on the aft deck. Large C-Shaped settee to port, with two large dining tables. Bar is located to starboard. Has Whirlpool chest freezer, coffeemaker. Full forward of the main salon are 5 steps leading to the forward stateroom areas and access to the forward deck through a ladder and hatch. Entertainment center aft of the main salon area features flat screen TV, DVD. Aft of the Entertainment center are 4 steps leading to the aft stateroom areas. Master stateroom is aft. Upon entry, step up to the queen-sized island bed. To port is a vanity with seat. Starboard is a bench seat. Cabinets and drawers on either side of the bed. Ports surround the cabin, with 4 on the side and two aft. En-suite head and stall shower. VIP room is forward at the bow. Queen island berth. Generous storage in cabinets, drawers and hanging lockers. En-suite head and stall shower. Hatch leads to forward deck at passageway aft of the VIP stateroom and between the two forward guest staterooms. Four guest staterooms, each with sleeping for two. Guest staterooms are located two forward on either side, two aft on either side. Forward guest cabins are located port and starboard, aft of the VIP Stateroom. Both feature double berths, generous storage in drawers, cabinets and hanging lockers. En-suite head and stall shower. Aft guest staterooms are located to port and starboard, forward of the Master Stateroom. Both feature twin berths generous storage in drawers, cabinets and hanging lockers. En-suite head and stall shower. All staterooms with their own a/c controls. A hallmark of Turkish Gulets is its spacious and luxurious wooden deck areas that encourage outdoor living and cruising. Aft of the hydraulic windlass at the bow are two expansive teak deck areas, all equipped with seating and lounge cushions for up to 12 people. Forward is a curved bench and table. Aft and on the second level is a deck lounge area with full length cushions aft of the main mast. Wide side decks surround the vessel, allowing ease of movement around the boat. At the stern are SS davits for the Zodiac Pro12 Center Console tender, with Yamaha 90 hp engine. SAILS: Jib, mainsail and mizzen. Cruise at a respectable 6.5 knots under sail!